Remember the joy of ditching class back in high school for a stolen day at the beach? Sure, skipping class was great, but it was as much about the little taste of rebellious freedom as it was about missing lectures. The “Ditch Fridays” daytime pool party at the Palms Las Vegas Pool and Bungalows takes that sense of fun and rebellion and kicks up a notch into the adult party scene. Created as a way to kick of the weekend early, Ditch entices you to skip your day job this Friday in Las Vegas and join the party. Locals ditching work get an added thrill as they mingle among the 3,500 bodies, wondering if they’ll spot their boss among the throng; but the hint of danger is part of what makes Ditch so enticing. Cold drinks that really pack a punch are served from one of three bars, including one right at the entry so you can get your party on fast. Meanwhile, the Glass Bar is located under the pool for an unusual view of the action, and the Waterfall Bar hides coyly behind a cooling curtain of water. If you’re a fan of Miller Light, you’ll be in even better shape, as they sponsor this Palms Pool Party. Rumor has it that anyone spotted drinking one of their beers may just be whisked away to a VIP section by a blue bikini clad beauty. There, a separate DJ and private bar will upgrade your experience from rebellious to downright indulgent. Skip work, but don’t skip Ditch Fridays Palms pool and dayclub, your high school beach party all grown up! More info on Free Vegas Club Passes’ exclusive Ditch Fridays guestlist below. Music Style: House, rock, hip-hop and Top 40. 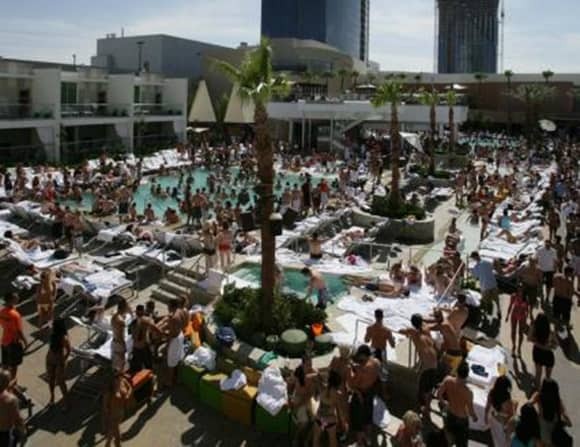 If you want to join in on this Palms Pool Party in Las Vegas, you won’t want to wait in a line all afternoon to do it. Let us hook you up with free entry and no line!